It’s time for another SUO challenge and this time our theme is to make a Shaped Card! I don’t do that enough…make a shaped card but I have to say, I really had fun making this one! Not only did I make a shaped card but I also did something I haven’t done in FOREVER…I made it a shaker card! Crushed Curry – 5 x 5, cut using largest star framelit, add to front of Crushed Curry base so that the front is a full star. Window sheet – 4 x 4, cut out using 2nd to largest star and add behind frame. Add dimensionals around the back side of the frame on the window sheet. 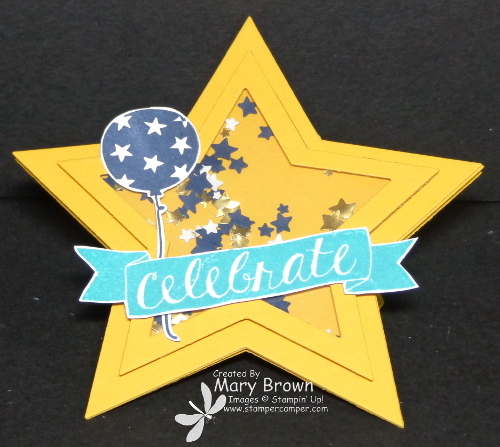 Punch out Night of Navy and Gold Foil stars using the Star Border Punch. Add to the enter of card base then add the star frame/window sheet on top of it. 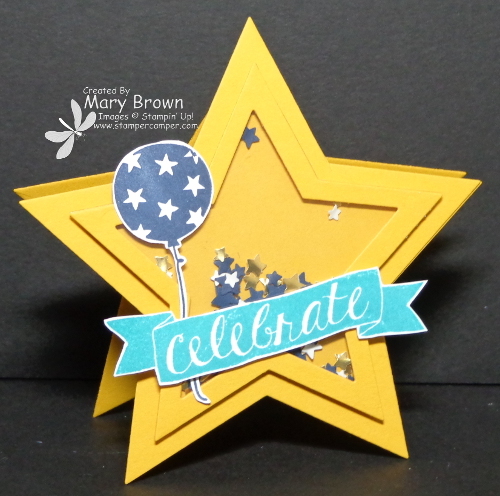 Stamp star balloon using Night of Navy, cut out and add to card base. Stamp Celebrate Banner using Bermuda Bay, Cut out and add to card front using dimensionals. This entry was posted in Spring Mini, SUO Challenge and tagged Balloon Bash. Bookmark the permalink.